This park is beautiful. The gardens are well kept. The sites are very clean. I would stay here again in a minute. The value for your money is excellent. 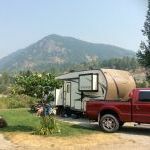 We camped at Kootenay River RV Park (Formerly Kootenay River RV Kampground) in a Fifth Wheel. For us, the best part about this Park is that it is adult oriented with quiet times 24 hours a day. This makes for good sound sleeping. All services worked very very well, and the staff are very good. 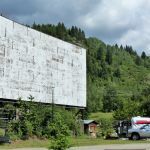 Great access to the river for fishing, and tons of walking and hiking trails in the area. Could only find two negative things - the road going in and out is very narrow, so watch for RVs coming and going, and the lids on the garbage bin are very heavy. 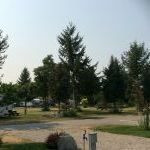 We camped at Kootenay River RV Park (Formerly Kootenay River RV Kampground) in a Travel Trailer. This is a very well kept campground. The owner really takes pride in the campground. Sites have a very nice grass area to sit. We had a river view site which was great. Would definitly stay again. 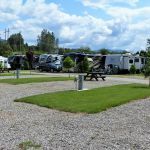 We camped at Kootenay River RV Park (Formerly Kootenay River RV Kampground) in a Motorhome.